This rare toy is part of my collection, it was a promotional toy for the Navy Week. He is made of velvet, he has orange and black glass eyes, his sailor's hat is original and has `Navy Week' written on it. He also has his original collar, a celluloid covered metal makers button and red and white woven label on leg. --8in (21cm.) long. 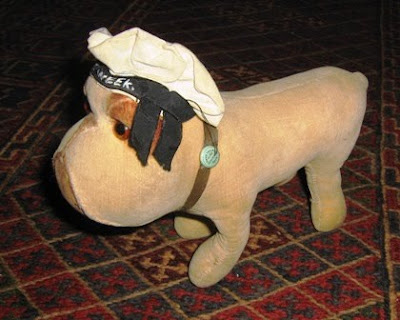 I have my Father's Navy Week bulldog - unfortunately missing the cap, collar and a little stuffing - from c1937 (possibly Chatham Navy Week).